RegData was created to introduce an objective, replicable, and transparent methodology for measuring regulation. It quantifies regulations based on the content of regulatory text using a custom-made text analysis program that counts the number of binding constraints or “restrictions”—words that indicate an obligation to comply. These words are shall, must, may not, required, and prohibited. RegData also uses machine-learning algorithms to map regulations to the sectors or industries of the economy that are most likely to be affected by the regulations. The RegData project was launched in the United States in 2012 with the express purpose of facilitating research that was previously not feasible. Regulations have been an important and widely used policy tool for decades, but empirical analysis of regulations’ actual effects was historically hampered by a paucity of data. Historical data going back to 1970 are available for the US Code of Federal Regulations (CFR), and current data are available for most US states. Growth in the number of restrictions can serve as a first approximation to the measurement of the aggregate regulatory burden at the national or subnational levels. Counting restrictions is also a considerable improvement on earlier research that relied on page counts. The restriction variable has demonstrated association with a number of economic variables, including economic growth, productivity, and consumer prices. RegData Canada is a new part of the RegData project. It uses the RegData framework to create multiple datasets from the regulatory code of Canada and the regulatory codes of the Canadian provinces. The datasets include statistics such as the number of individual restrictions, the industries that those restrictions are likely to affect, and the agencies responsible for the restrictions. RegData Canada maps Canadian federal and provincial regulations to the sectors and industries most likely to be associated with them using the North American Industry Classification System (NAICS). It captures information in minutes that would take hours, weeks, or even years to obtain by reading and counting. Regulatory text for this project was derived from three primary sources: First, for the federal regulation dataset, historical point-in-time regulatory files were made publicly available by the Treasury Board of Canada Secretariat. Second, for the 13 provincial and territorial datasets, regulatory text was downloaded from individual provincial and territorial websites. Finally, data from the current consolidated regulatory code were downloaded from the Canadian Department of Justice’s laws and regulations portal. While this is first time data on regulatory restrictions for the Canadian federal government and for the Canadian provinces are available, there have been other regulatory counts done by Canadian governments. For example, British Columbia (BC) has been tracking “regulatory requirements” since 2001, when a baseline of 330,812 was established. BC’s definition of regulatory requirements is similar to RegData’s definition of regulatory restrictions, but broader as it includes obligations found in legislation and guidance documents in addition to those found in regulations. RegData Canada, conversely, only tallies prohibitions and obligations found in regulatory text alone—therefore, restrictions in legislation and regulatory guidance documents are not included. BC’s regulatory requirements count is currently 166,919, according to the BC government’s latest report. Figure 1 shows BC’s regulatory restriction count, from RegData Canada, at 15,605. British Columbia is the longest-standing example of a Canadian jurisdiction that has consistently reported a measure, but there are other Canadian examples. Ontario did a similar count to British Columbia’s and found 466,251 requirements in 2008 and 386,251 in 2012, after which they stopped reporting the measure. The Ontario government recently announced it would use the 2012 baseline as a starting point for its new reform initiative to reduce regulation by 25 percent by 2022. Manitoba recently developed a comprehensive methodology to count regulatory restrictions and established a 2016 baseline of 948,599. In 2018 the count stood at 924,180 requirements. At the federal level there is a count called the Administrative Burden Baseline (ABB) that covers some requirements that impose administrative burdens on business. In June 2014 the estimate was 129,860 requirements; some departments have updated counts for 2018. Several other jurisdictions in Canada, including Quebec and, more recently, Nova Scotia, are reporting cost measures. 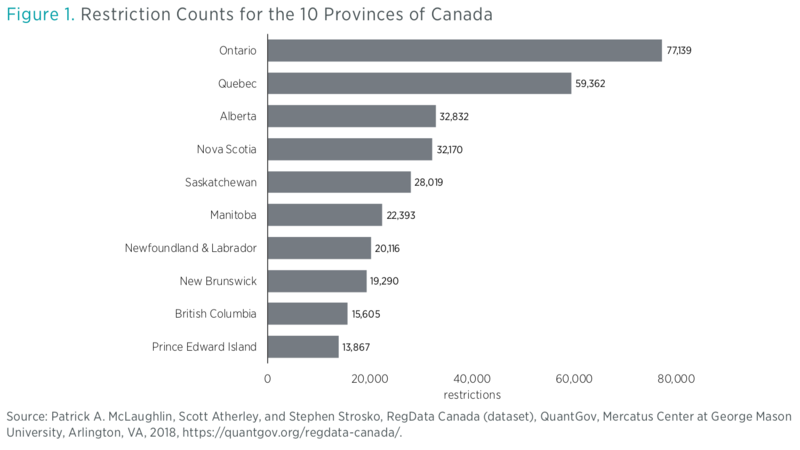 RegData Canada provides a unit of measurement that is consistent between provinces. 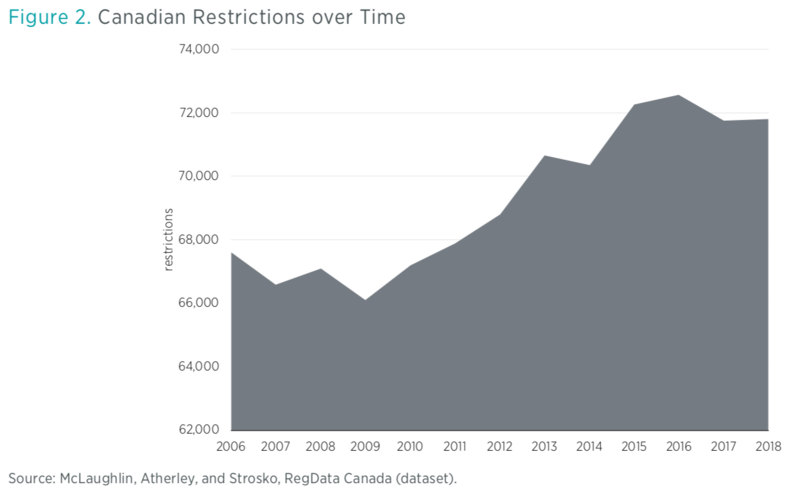 Figure 1 shows a wide range among the numbers of regulatory restrictions in each province, from Ontario’s high of 77,139 restrictions to Prince Edward Island’s low of 13,867 restrictions. When comparing provinces, concluding that one province has a heavier regulatory burden than another should be done with caution, as there are government rules in instruments such as legislation and guidance documents that are not part of the RegData Canada regulatory restriction count at this point in time, and differences in industrial mix and diversity can contribute to differences in regulatory counts. At the federal level, data are available from 2006 to 2018. The data in figure 2 show a time-series count of federal regulatory restrictions over that period. Results indicate modest growth in total restrictions over the time period. The Canadian federal government was responsible for an estimated 71,801 active regulatory restrictions as of March 2018. Equivalent figures for the United States are substantially larger. The US federal government is currently responsible for just under 1.1 million regulatory restrictions. However, as was noted with respect to provincial comparisons, since restrictions can come from sources that are not currently included in RegData, such as legislation or guidance documents, caution should be used in making direct comparisons. By-industry data at the provincial and federal levels are also available in the RegData Canada datasets at QuantGov.org.